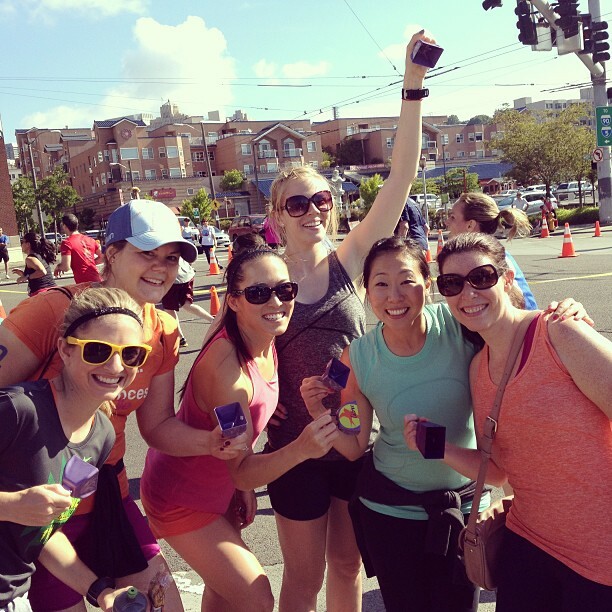 Instead of running the Seattle Rock ‘n Roll this year, I decided to help hydrate runners with Nuun and cheer with some blog & Twitter friends. I’ve never cheered or volunteered at a race this big and it was so much fun. Can I please do it again this weekend? Anyway, to recap the day: I woke up bright and early at 5:45 (insert Grumpy Cat face here). I made it over to the International District pretty fast, despite the fact that many roads and exits were closed. I decided to wear some capris and my long sleeve Marine Corps Marathon shirt, thinking it would be chilly most of the morning. After all, it’s June in Seattle. After standing around for 15 minutes, I realized how warm it was getting and I felt bad for the runners, especially the marathoners. It was so cool being able to see the elite runners pass by and I even got to give some of them Nuun. Boy were they flying. Once the elite runners passed, the Nuun station was slammed. It was hectic but also a ton of fun. I saw Stacie at the Nuun tent and gave her a quick hug (Stacie, you looked great in your Nuun singlet). We were able to see Lauren and Stacie go by but I never saw Robyn, unfortunately. I also saw the man below, who was running the half marathon on prosthetic legs. Amazing! You can read the full story about him here. I kept shaking my cowbell and didn’t want to stop cheering, despite the fact that it was killing my fingers. I probably should’ve stopped when I noticed blisters forming and after I noticed blood on my fingers. This is the first cowbell injury that I’ve sustained but at least I had fun doing it. Is anyone racing this weekend? If so, I want to come cheer for you but maybe this time, I’ll wear protective gloves or something.